In 2017, South Sudan once again reported the lowest per-capita GDP ever, closely-followed by Burundi and Malawi. All three countries struggle economically, because of poorly developed infrastructure and a low standard of living. A country’s gross domestic product, often referred to as GDP for short, is a means to measure the market value of goods and services a country has produced over a certain period of time. It is an important key indicator for a country’s economic status and development. GDP per capita is the breakdown of GDP to the country’s total population, showing how much each of the inhabitants have theoretically obtained. GDP per capita is a popular measure of the standard of living, prosperity, and overall well-being in a country. 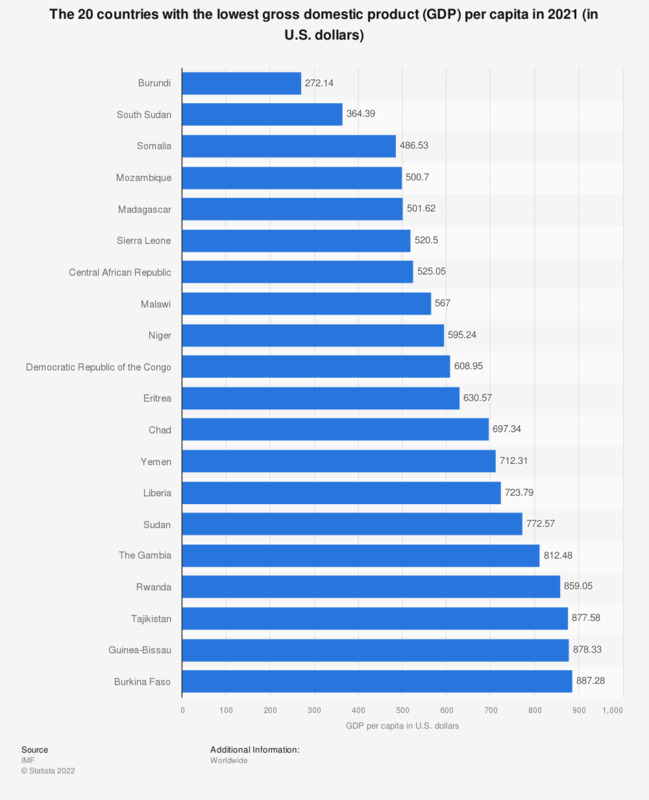 A high GDP per capita indicates a high standard of living, a low one indicates that a country is struggling to supply its inhabitants with everything they need. South Sudan’s 13 million inhabitants have been struggling with severe poverty, high death rates, civil wars, and violence for years now, and their standard of living is respectively low. Today, the country relies heavily on agriculture with the majority living in rural areas, but violence, the lack of food, and inefficient water supply often cause famine and illnesses. Since South Sudan thus cannot produce and export goods efficiently and sufficiently, GDP per capita does not even reach four-figure levels, despite a quite low number of inhabitants. NGOs and government agencies are trying to improve their situation by offering funding and education, but significant improvement has yet to be seen. Looking ahead twenty years, which one of the following countries do you expect to be the world's leading economic power at that time?